Maine Department of Transportation will share its preferred option—rehabilitate, replace or an alternative bridge—to the nine-member Bridge Advisory Committee on February 13. 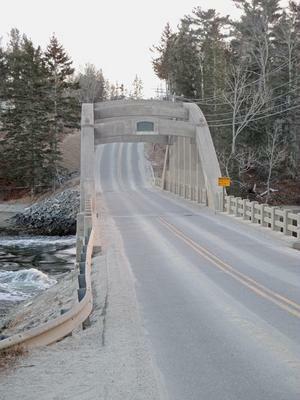 The probable fate of the 1926 double tied-arch Falls Bridge will be revealed when Maine Department of Transportation shares its preferred option—rehabilitate, replace or an alternative bridge—to the nine-member Bridge Advisory Committee on February 13. A public hearing announcing MDOT’s final decision will then be scheduled, likely in March, Blue Hill Selectman and committee facilitator Jim Schatz said at the January 25 selectmen’s meeting. The two meetings signal an end to a seven-year process that began when MDOT first tapped Falls Bridge for repair or replacement. Three adjacent sites containing architectural, Native American and early settler artifacts, and environmental impacts to endangered fish, wintering ducks and the federally endangered northern long-eared bat, were behind the long delay, and required the Maine Commission on Historical Conservation and Federal Highway Administration to become involved. Mitigation or avoidance plans will be part of the overall project design plan. The MDOT and bridge committee considered these factors, cost, public safety and more for nearly two years of meetings, a process MDOT uses on projects like these to ensure community buy in. Rehabilitation has a price tag of over $8 million for an estimated 50 year life span. Replacement is estimated at $4.6 to $5.3 million for a 100 year life span. Service costs for a 100-year period come in at $15.5 million for rehab and $7 million for replacement. For either option, decisions over constructing a temporary bridge or using a 20-mile detour for travel during construction, which is expected to last 18 to 24 months, are on the table. If the bridge is to be replaced, an accelerated construction schedule, lasting 50 to 60 days, with major construction occurring off site, is another option. Building an alternative bridge would cost $14.4 million, with a service life cost of nearly $20 million. If replaced or rehabbed, travel lanes will be 11 feet, and the bridge raised 2 to 4 feet to allow for expected sea level rise, the steep approach from the South Blue Hill side will be leveled, and in-water construction would be performed November through March, according to information presented at an August 29 public meeting. Refinements to the design, such as whether to build a sidewalk on one side, “can be addressed ongoing,” committee member and Selectman Vaughn Leach said. Bridge construction is expected to begin in 2020 or 2021.